A new TCFA instructor, Lisa Craig Fenwick, will present a short free concert-demonstration of harp and flute music on Sunday, October 2, at 4pm. For anyone who has wondered what it may be like to play the harp or flute, this is a perfect event! Families especially will enjoy the music but after the performance, will have a chance to handle sample instruments—small harps and scaled-down flutes—and ask questions. Ms. Fenwick teaches fairly young students starting out on both these instruments and she has a limited number of starter instruments available to rent. 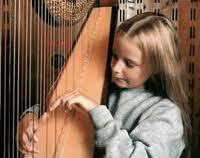 With Kinderflute training, she can teach very young children. A long-time teacher for students of all ages and levels, Ms. Fenwick trained originally as a flutist at the Boston University School of Fine Arts. She taught at SUNY Cortland and, for 23 years, at Ithaca’s Community School of Music and Arts. Once she took up her harp study, she moved on to performances at many weddings, private functions and recitals, as well as with ensembles and orchestras in the Finger Lakes and beyond. She especially enjoys working with children and strives to teach meaningful practice methods, great technique, excellent music reading skills, and most of all, a lifelong love of music. The October 2 event is free and open to all, with light refreshments.